The Swedish explorers Mikael Strandberg and Johan Ivarrson have successfully completed their nine-month long expedition along the Kolyma River. On April 21, 2005 they reached the Ambarchik Polar Station at the coast of the East-Siberian Sea. The explorers started their grueling expedition at the south near the sources of the legendary Siberian River and have followed the River north for over 2500 km. 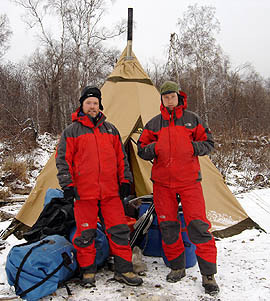 Mikael Strandberg and Johan Ivarsson started their route on August 1, 2004 from the confluence of the Ayan-Yarekh and Kulu Rivers – the sources of the Kolyma River. The two men were initially accompanied by Titti Strandberg, the third member of the expedition and the expedition project manager. The first part of the expedition passed along a water route. The two explorers sailed on a kayak over the River north through the most inhospitable terrain on Earth. The first short stop was made on September 2, 2004 at the Seimchan settlement. Then the team forwarded their route to Zyryanka – a settlement, situated in the middle part of the Kolyma River. In Zyryanka the explorers made a stop, waiting for the beginning of winter. On November 17, 2004 they continued their route on skies over the ice of the frozen River. During this period the explorers experienced all power of the Siberian frosts. The temperatures fell to -60°C. Each breath was transformed into a shower of ice crystals. "The main problem right now is that thereґs almost impossible to take a break. It is almost unbearably cold. Almost terrifyingly cold. The only thing one can do is constantly move and hope to avoid as many obstacles as possible. Weґve been pretty lucky so far. Weґve navigated to near perfection, even though we cannot follow the shortest way due to big areas of broken up ice which are extremely difficult to pass. Weґve, so far, had no problems with spotting open water, since itґs smoking like the worst fire due to the cold. An inch of snow covers the ice, so it could be much harder. But the cold is harder to handle than I imagined. And worst of all is, itґll just get colder every day from now on until mid-February". Besides unbearable cold and danger of meeting with wild animals the explorers had stand the test of polar night. During almost three months the Swedish explorers travelled in complete darkness with only occasional moonlight. On December 11, 2004 they reached the town of Srednekolymsk, overcoming two thirds of their route. On March 16, 2005 the team arrived in the Kolymskoye settlement, from which they started the next to last stage of their route to the Chersky settlement, situated in the mouth of the Kolyma River. Mikael Strandberg and Johan Ivarsson reached this point on April 10 and after a short rest started their final leg to the coast of the Arctic Ocean, which they reached in 11 days at the Ambarchik polar station. The Expedition was completed. The team returned back to Chersky and then took a flight to Moscow.